It’s Super Bowl week and the Browns aren’t in Sunday’s big game, not yet anyway. But what they do this offseason will have major implications on their chances to get there next year or in the near future. General manager John Dorsey and company are hard at work scouting and ranking the prospects entering the NFL this spring. That process has been ongoing of course but really picks up starting at this past weekend’s Senior Bowl. 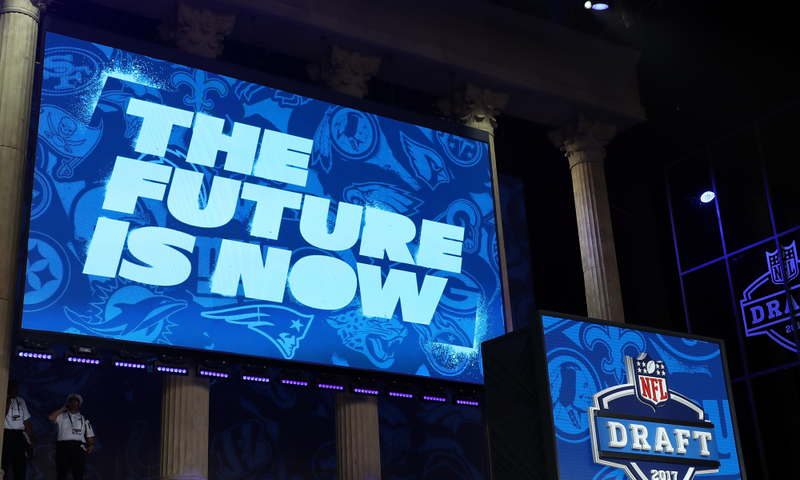 With that in mind, our NFL Draft coverage begins with our first Mock Draft of the offseason. In this one we set a baseline rule of no trades. So essentially, what would the draft look like if every team stayed put and drafted for an immediate needs? Who did we have the Browns selecting? Take a look and see if you agree as we mock through the entire first round of the 2019 NFL Draft. The Cardinals have a lot of needs, particularly on offense. But pairing the consensus top prospect Nick Bosa with Chandler Jones is the foundation of a dominant defense in the making. Another Bosa goes in the top five. This a no-brainer for the Cardinals. Unless they want to OL, Bosa is the top choice. Hard to pass on Quinnen Williams if you’re the 49ers but defensive tackle is also not a need. A legit pass rusher on the other hand is a massive one, so I have them going with Allen here as the next best edge rusher available. This would be an intriguing pick. I anticipate the 49ers going with DT Quinnen Williams from Bama. This would be more of a stunner if it’s Allen. The thought of letting Williams slip any further is unfathomable. This isn’t necessarily a need for the Jets but any team would be lucky to add a player of Williams talent. This would be a great pick for the Jets but not one they need to force. They could use more help on the edge. They could also be in position to trade down for a QB-needy team. You may have heard that the Raiders are looking for a pass rusher? They may have traded away the best one in the game prior to the 2018 season. Gary is Khalil Mack’s replacement and one with an extremely high ceiling. He played inside maybe too much in college but will try to sell himself as an edge rusher leading up to the draft. The slide didn’t last long nor do I believe the soon-to-be Las Vegas Raiders will have the opportunity to grab a guy like Williams. If he falls to the Raiders. Not even Jon Gruden can say no to him. But he might be crazy enough to trade down. With Gerald McCoy’s future with the team cloudy, the Buccaneers quickly find his successor in Oliver. Burns has risen up the draft boards. TB needs to put more pressure on the QB. They could also use a corner here as well. The Giants decided against taking a quarterback last year with a deep class to choose from. They simply can’t keep putting off this need forever and grab the first QB off the board in Haskins. Maybe this seems early to take any QB this year but it’s no secret that the value of a quarterback warrants reaching sometimes. Eli will ride off into the sunset soon. It’s time get your next man. The debate will be Haskins and Murray. Giants go Murray here but there should be a real concern over leaving baseball open as an option still. I’m anticipating that the Jaguars make a move for one of Joe Flacco or Nick Foles negating their need to draft a quarterback here. Instead they get their new QB some protection in Williams. Sure, they could use a tackle. It’s no secret, the Jags need a QB. A draft pick like this only takes place if they trade for Nick Foles. Otherwise, this is where Haskins or Murray will land. There are a number of directions the Lions could go here, cornerback, defensive line, edge rusher. Ultimately, their need for a shutdown corner reigns supreme as they take Williams. Good news for the former Wolverine, he won’t have to move out of state. The Lions need help on the defensive line. The thought of taking Christian Wilkins to replace fan favorite Kyle Williams or a Clelin Ferrell is certainly enticing here for Buffalo, especially with a defensive minded coach in charge. But the Bills can no longer neglect the offensive side of the ball. Keeping Josh Allen upright is of the utmost importance. Not many will know about this pick. Some experts says Ximines is a top 15 pick. We’ll he lands at No. 9 to the Bills. Bills Mafia, do some research on him. Vic Fangio doesn’t sound committed to Case Keenum long-term. Reports from the Senior Bowl suggest that they love Lock. Will John Elway finally get a QB selection right? Broncos are a QB-needy team. This is where a Drew Lock could land. Greedy Williams is about as good as it will get for corners this year. If it’s not Denver. Someone will take him and will be paying for Elway’s dinners for years to come. The Bengals have a serious need for linebackers. White is an easy choice here. It’s not time to find Andy Dalton’s replacement just yet. Oliver was consider one of the top edge rushers this year. I think the Bengals need to look at offensive line here. Needless to say, Oliver would be just as good as of a pick. With two picks to work with here in the first round, Green Bay addresses a defensive shortcoming first with the selection of Ferrell to help strengthen their pass rush. Trade down alert. Let’s be clear. Packers can always use more defense. Aaron Rodgers won’t be happy about this pick more than likely. Packers need to add as many weapons as possible while Rodgers is still playing at a high level. The Ryan Tannehill ship has sailed. With a new head coach coming in it’s time to start fresh with a new QB as well. Murray is ready to put his baseball career on hold and try his luck at football first and the Dolphins give him a shot. Haskins probably won’t land this far. Again, a QB-needy team will trade up. If Murray isn’t the top choice at QB. Haskins absolutely is. Atlanta was putrid against the run this season. Their defensive line needs a makeover and they start by adding Simmons into the fold. White is absolutely the best linebacker in this draft. Falcons need help on defense. Depending on the status of Alex Smith, expect the Redskins to be in play for a Joe Flacco or Nick Foles as well. They could also consider drafting a quarterback here as well. Ultimately, with a number of needs on offense I think they address the QB position elsewhere and add a weapon for whoever that ends up being. The Redskins could use more depth in the secondary. Here’s a solid option. It’s also known they need more weapons on offense and they potentially draft a QB because no one knows if Alex Smith can play football again. Carolina has a handful of needs, particularly on defense. Polite is potentially a top-10 talent and has fallen into their lap at this point. With Julius Peppers set to hit free agency, drafting Polite is a no-brainer. This is a potential trade down for a QB-needy team again. Nonetheless, Panthers need to protect Cam Newton more. Especially after another shoulder surgery. The need OL help badly. Here it is, the pick you’ve been waiting for Browns fans. Cleveland’s defense ranked in the bottom five of the league against the run in 2018. That needs to change and one of the fastest ways to do that is by adding a space eating defensive tackle like Wilkins. There are cases to be made for going wide receiver or cornerback here as well, but I truly think they’ll explore their trade options for another wide receiver. Also, because injuries derailed things in the secondary last season, running it back with the same group is something to consider. The Browns ranked 30th against the run. They’ll have new defensive coordinator Steve Wilks calling the shots. They get him more help by drafting arguably the third best defensive lineman in this draft. The Browns could also go secondary, wide receiver, or offensive tackle here as well. The Vikings overpaid for Kirk Cousins, now they have to do their best to salvage their investment by protecting him. There is an argument to be made for a defensive tackle here but offensive line is the more pressing need for sure. The Vikings and Browns could potentially trade picks and the Browns would pick Greg Little here. That would give many Browns fans bad nightmares of former Browns WR Greg Little. The Vikings are one of those teams who could use help. But it’s more about execution on the field more than anything. Harris and Deebo Samuel are probably my two favorite wide receivers of this class. Harris could probably serve to add some muscle (he’s only 213 pounds) but he has a chance to be a stud and the Titans need weapons on offense. Offense is what the Titans really need. But adding to the defense never hurts. Artie Burns just isn’t the player Pittsburgh thought he’d be. Now, they’re left desperate for a cornerback opposite of a soon to be 30-year-old Joe Haden. Murphy is the guy. He’s got shutdown CB written all over him. RIP the rest of AFC North defenses if the Steelers choose Jacobs. James Conner is now the main man carrying the Ball. The Steelers would like to pair someone with Conner. Insert Jacobs. A potentially deadly running back duo for a long time. It’s safe to say Seattle surprised people by making the playoffs after blowing up their defense ahead of the 2018 season. They still have some holes to fill though, particularly needing a stronger edge rusher. Enter Montez Sweat, who tore it up at the Senior Bowl. Another college player gets to stay in the same state. This time it’s Dillard. Year after year, Russell Wilson has been running around like crazy because of lack of protection. Seattle, it’s time to change that. Lot of directions the Ravens can go here. They need an edge rusher, offensive lineman and receivers. I think Jacobs is an interesting option here though. The Ravens struggled to run the ball this year and didn’t have a consistent go-to guy out of the backfield. Jacobs can take on that role. Ravens could use more OL help. Especially having to protect a QB who will scramble and hold onto the ball. Nobody was sacked more than DeShaun Watson in 2018. The Texans gotta bolster the O-line and they do with the best offensive lineman available in Ford. There aren’t many holes for the Texans to fill. Grabbing a guard or trading down is the move here. Pick two of three for the Raiders here with this one coming via the Bears as part of the Khalil Mack deal. Having already gone defense with his first pick, Jon Gruden adds a weapon for Derek Carr this time around in Brown, the best receiver still available. Smart move with the receiver needy Colts looming. Bush isn’t as polished as Devin White. But he will be labeled as trying replace Mack. Best player available at this point and a player who can transform the Eagles secondary. The Eagles were without their starting quarterback at the end of the season. Wentz was never truly 100% healthy this season. But the bigger problem was lack of depth at corner. Well, here’s a good fit. Murphy is athletic, speed, and dependable. With a boatload of cap space, Indianapolis is going to be very much in on the Antonio Brown and Le’Veon Bell sweepstakes. If they land one or (miraculously) both of them the move here is defense. I’m banking on them landing one of the two (most likely Bell) which means they’ll turn their attention towards the defensive side of the ball with this pick. The Colts are far away. They could use depth at the secondary, linebacker, and wide receiver. Brown would be a good fit for the Colts. Giving Andrew Lucks as many weapons as possible could maximize his full potential. The Raiders go defense with two of their three first-round picks. They need it too. First off, it’s hard for me to see the Raiders keep all three first round picks. Second, it’s hard for me to see them draft three defensive players. Yes, they need help badly on that side of the ball. The Raiders need to add more weapons around Derek Carr while he is still a Raider. There are probably larger needs than tight end for the Chargers but another weapon for Phillip Rivers can’t hurt, especially now that Antonio Gates is now 38. You know what, I don’t mind this for the Chargers. They don’t have many holes to fill other than performing better against Tom Brady. Developing Drew Lock behind a future hall of famer makes sense. Who knows how much longer Phillip Rivers has. This makes sense. It’s defense, defense, defense for the Chiefs. Cornerback is a major need and they get a good one in Baker. Mullen balled out against the Alabama. The Chiefs couldn’t even stop a slant in overtime against the Patriots. So yes, they could really use some help in the secondary. TWO Iowa tight ends off the board in round one? Stunning. Hockenson is the type of target Aaron Rodgers dreams about having. At 6-foot-5, 250, he and Rodgers will develop quite the connection. I’m not sure Green Bay is where he ends up. I also don’t think the Packers go all defense in the first round. Again, surround Rodgers with as many weapons as possible. Are the Patriots going to pay to retain Trey Flowers? If not, they’ll need to invest in their pass-rush. Let me be clear, I don’t think Jones falls this year. Nor do I think the Patriots take him. Though it shouldn’t shock anyone if they did. Like the chargers, Jones would picked to develop behind Brady as a future replacement. Although, Brady just said he plans to play until he’s 45. He’s currently 41. This is the case of best player available here but it is a need for the Rams as well, particularly with Ndamukong Suh set to hit the market and Dante Fowler. Los Angeles will want to resolidify that defensive line. There’s an obvious need at CB too with a number of defensive backs set to enter free agency. The Rams could definitely use more help in the secondary. Here’s the perfect fit. Baker is athletic, fast, smart, and plays hard. He’s got a swagger to him that you don’t always find.